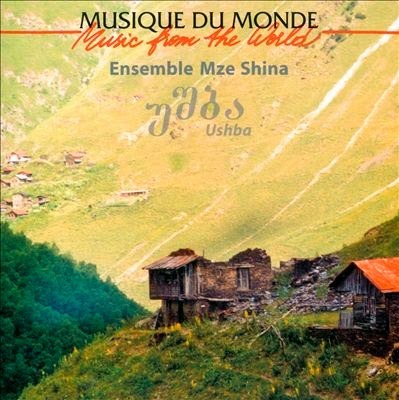 This blog has been created to introduce "the other" world music: less unknown artists, ethnic musical instruments, rare discogaphies, world music travel and music festivals... Comments are well come!!. 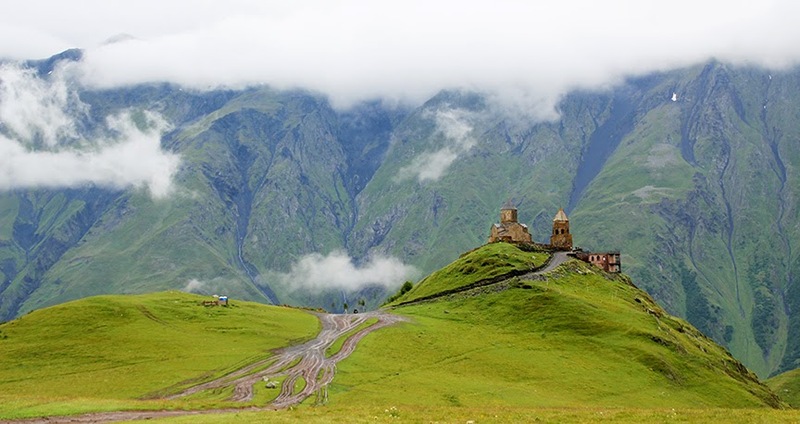 Georgia is a small mountainous country situated in the Caucasus. It is bordered in the south-west by Turkey and Armenia, in the east by Azerbaijan, in the west by the Black Sea and in the north by Russia Federation (Karachay-Cherkessia, Kabardino-Balkiria-Ossetia, Ingushetia, Chechnya and Dagestan). Georgia’s population is about 5 million. 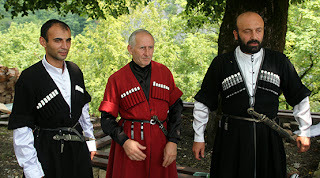 Ethnic Georgians form about 85% of population. The remaining are formed by ethnic groups from the neighbourhood regions such Abkhazians, Armenians, Ossetians, Azerbaijanis and Russians; ex -soviet countries such as Belarusians, Bulgarians, Estonians, poles, and Ukrainians. There also Turks, mainly in the south, a significant Jewish community and Iranian immigrants. 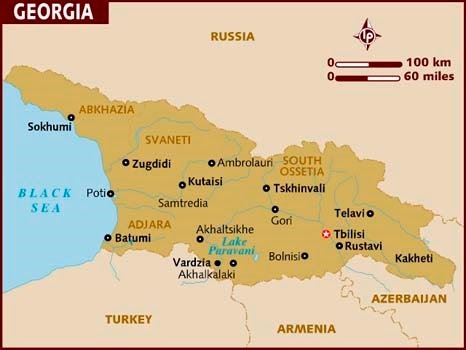 Despite the Russian/soviet influence, Georgia has its own non-indo-European language and its own writing system. It comes from the Kartvelian family group, which includes Georgian, Svanetian (north-western mountains of Svanetia region), Megrelian (western regions of Samegrelo and Abkhazia) and Laz (in south coast of Black Sea). Georgia adopted the Christianity in 337, and large majority of Georgian population is Christian Orthodox. There are also small communities of Georgian, Jews and Muslims (near the Azerbaijan border). During centuries many churches has been built. 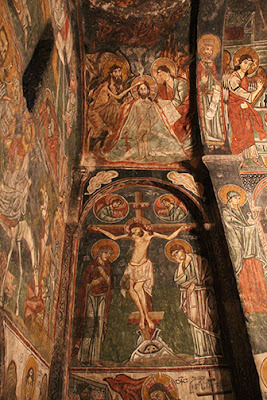 The Bagrati Cathedral, the Gelati Monastery and the medieval religious monuments of Mtskheta are in the list of Unesco World Heritage list. Tbilisi is the capital of Georgia. The old town is very pleasant and it can be visited on foot. The Matkvari river cross the city giving delightful sights from Meidan bridge. It is still possible to see old houses with nice balconies, beautiful small lanes and many cafes and bars in the pedestrian Erekle II and Sharden streets. You can start to walk down from Rustaveli to Betlemis squares. 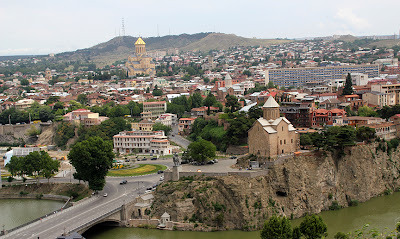 The main sights in Tbilisi are the Tsminda Sameba Cathedral, Metekhi Church, Nariqala Fortress, Sioni Cathedral and the Museum of Georgia. 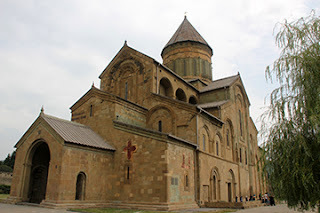 The Georgia highlights near Tbilisi (one day trip) are the Jvari Church and, Svetitskhoveli Cathedral in Mtskheta and the Uplistsikhe pre-Christian temple caves near Gori. 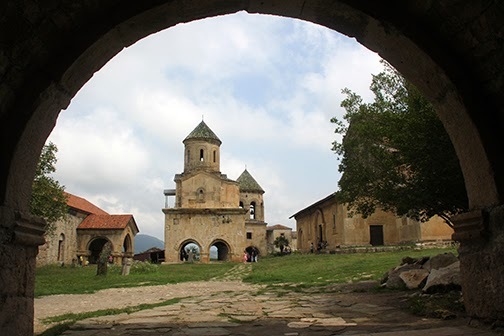 To the east at one-two days trip you can find the Bodbe Convent near the nice small town of Sighnaghi and the interesting Davit Gareja complex of old monasteries near the Azerbaijan border in the beautiful desertic and remote place. Near Telavi you can visit the Alavardi cathedral and the Gremi citadel. To the north in one day trip you can visit Ananuri church, Geregeti Semeba Monastery, Gori with the Uplistsikhe caves. To the west at about 4 hours trip there is the second large city of Georgia: Kutaisi. The most interesting is the Bragati Cathedral and at 6 Km the wonderful Motsameta monastery and at 9 Km from Kutaisi the impressive Gelati monastery complex. If you have time, don’t miss Svanetia region! To reach the town of Mestia you will pass a spectacular road with small towns such Lenjeri. 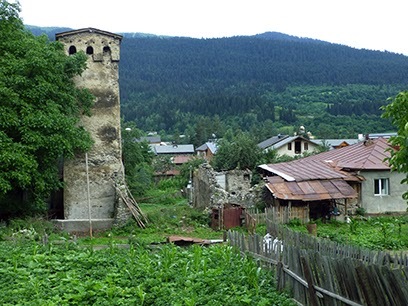 I recommend sleep at least one or two nights in Mestia to visit the small villages with the koshkebi, or defensive towers built between 9-11th Centuries. 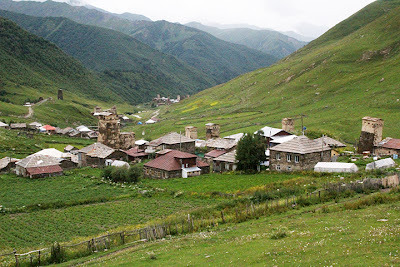 The remote town of Ushguli, at 2100 m above the sea level, is a 47 Km from Mestia. The road is unpaved. It has many Svan towers and it is on the Unesco World Heritage list. There are many wooden houses from 14 ethnographic areas from Georgia and exhibitions of different kinds of ethnographic tools, rugs, and ceramics. State Museum of Georgian Folk Songs & Musical Instruments. (Address: 6 Samgrebo St). It is a small museum, centrally located in the old town, with three rooms where you can see all the musical instruments commonly played in Georgia, but also from Azerbaijan and some European countries. There are nice old pictures of Georgian and Azari musicians The museum was created on the basis of AV Revazishivili's collection of musical instruments in 1975. A nice guy made me an explanation in English of the instruments on display. An interesting short video coud be also seen. This small museum is highly recommended! Near the entrance of the museum there is a small shop of musical instruments, in which there are several used instruments on display and very few instruments for selling, such panduries and salamuries. The seller doesn’t speak English. Learn to sing and to dance in Lenjeri. In the nice and small town of Lenjeri in Svanetia region, two km from Mestia, components of the Riho Ensemble organizes singing and dancing classes for several days. Sleeping and foot is provided. Singing classes are given by the director of the Riho Ensemble and his son, Islam and Vekhatang Pilpani, and dancing classes are given by Archil Murgvliani. If you are interested how to sing vocal polyphonic songs you have to go and you will be very welcomed. In this town you will also see the typical koshkebi or defensive towers of this región. During my visit to Mr.V.Pilpani, there was people from Canada, US, Australia and other countries, which were taking lessons of singing and dancing. 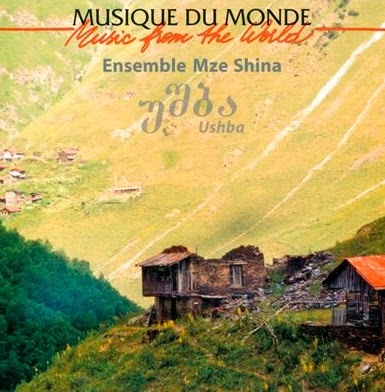 Traditional music is well preserved specially in the mountainous areas. 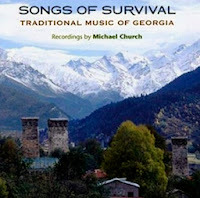 Polyphonic singing of Georgia has been included in the World Heritage of Humanity by UNESCO in 2001. Polyphonic Vocal Singing. It is very charactherisc of Georgia. Male choirs may use two, three of four part singing polyphonies depending on the region with different styles. The most common is the three part form: top, middle and bass voices. The bass voice use to be the chorus, the middle voice is the soloist part and the top use to be the second voice. It is characteristic the improvisation and competitive spirit. Polyphonic songs are used in working, drinking and wedding events. They are also used in masquerade performances, rituals laments or religious celebrations. There are also liturgical and funeral polyphonic songs. Vocal polyphonic songs may be sang acappella or accompanied by the pander. In Samaria may by also accompanied by the change and circle dances. Lullabies are mainly sang by a single woman accompanied by the chonguri. In Georgia you can easily found by chance a vocal choir singing in a church, in a wedding o around a table. There are very few CDs available in the international market, many of the have been released in France, and some of them are out-of-print. Below I list some the I recommend. Riho Ensemble. 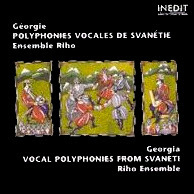 Vocal Polyphonies from Svanetia. Inedit, France. Highly recommended. Choral singing directed by Islam Pilpani. The group sings epic, ritual, religious songs. Some of these songs are used for round dancing. Few songs are accompanied by the chuniri and changi. It was recorded on 1999 in France. Folk Music from Georgia Today. Wergo, Germany, 1993. Twenty six traditional by three different ensembles: Solnari, Mtiebi and Mzetanze. 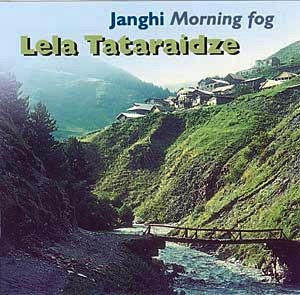 Recorded on 1991 in Berlin, Male and Women Choral songs, some accapella, with panduri or dholi. Some songs with the wind instrument named duduk. 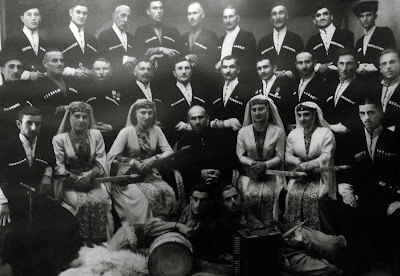 Rustavi Choir. 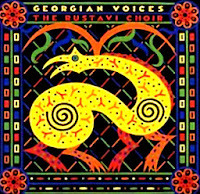 Georgian Voices. 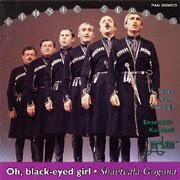 Anthology of Georgian folk songs, 1991 Nonesuch Explorer Series. Recordings from Melodiya Records between 1981 and 1988. The artistic director is Anzor Erkomaishvili. Several styles and types of songs are included: work, laments, table, and sacred songs. 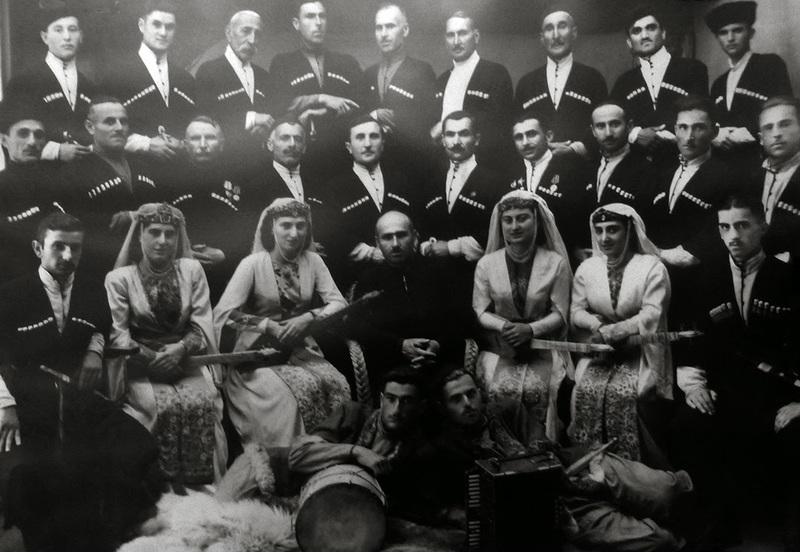 Rustavi Choirs is one the most famous. They have recorded many CDs in various labels. Kolkheti Ensemble. Shavtvala Gogona, Pan, Netherlans, 1992. Popupar male choral group. The director is Givi Shanize. Traditional songs recorded in Tbilisi in 1988 and 1989. Tsinandali Choir. Table songs of Georgia. Real Word, UK, 1993, Ensemble from eastern region of Georgia, Kakhetia. Ten table songs recorded by Melodiya in 1988 and released internationally by Real World. Arrangements by Levan Abashidze. Songs of Survival. 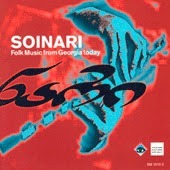 Traditional Music of Georgia, Topic , 2007. 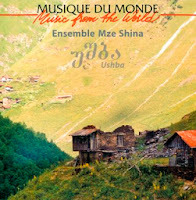 2CD compilation album by the UK based label and compiled by Michael Church. Fifty one songs of several artists and a complete inner booklet. Highly recommended. Ensemble Mze Shina. Ushba. Polyphonies of Georgia. Buda Musique, France, 2012. Vocal Polyphonic French quartet who sings traditional Georgian songs since 1997. The Shin. For those who want to explore a different kind of music, I recommend this trio. It is a progressive folk/world fusion group founded in 1998 by Zaza Miminoshvili (guitars, panduri), Zurab J. Gagnidze (electric and acoustic bass, vocals) and Mamuka Gaganidze (vocals, percussion). The trio is based in Germany, they are well known around Central and Eastern Europe because of their regular live shows (usually with different guest folk and jazz musicians, dancers, etc. 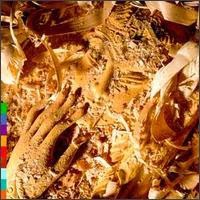 They have released several albums: Tseruli, 1999, Ibero-Caucasian style, 2003; Many Timer, 2004; EgAri, 2006; and Black sea fire, 2009. Highly recommended. Vertkov K et al. Atlas of Musical Instruments of the Peoples Inhabiting the USSR., State Publishers Music, Moscow, 1975. In Russian. Some parts with English translation. Out-of-Print. Jordania J. Georgia. The Garland Encyclopedia of World Music. Volumen 8. Europe. Garland Publishing, Inc. Taylor and Francis Group. London, UK, 826-849, 2000. Wonderful page of Levan Bregvadze. There are many great pictures of folk musical instruments of Georgia with explanations of how to tuning them. 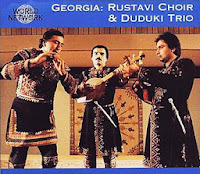 Many songs may be listen to online of groups such Rustavi, Umuli, Adila, Lashari, Georgika and others. Page of the Ensemble Adile and the choirmaster and musical instruments maker Maizer Gazdeliani. They have released two albums. for their help, information and kindness. 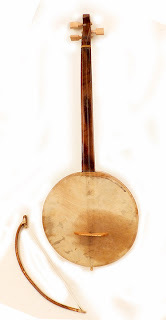 The most characteristic traditional instruments of Georgia are the chordophones: the panduri, the chonguri and the changi (in the Svanetia region, north-west of Georgia). 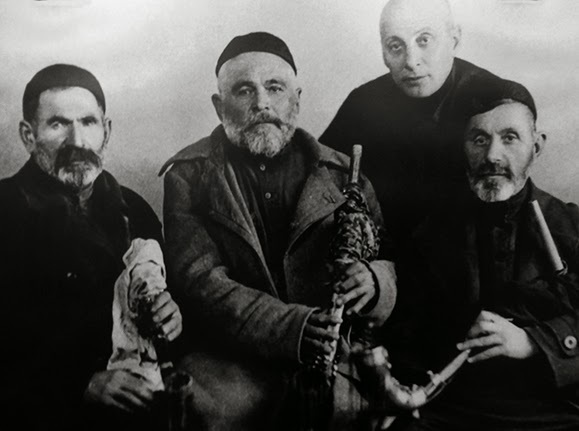 Some instruments of Georgia are played in other Caucasian countries (e.g. Azerbaijan, Armenia), specially the aerophones and and membraphones instruments. 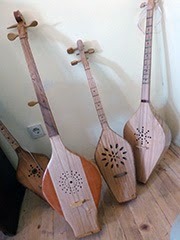 In Tbilisi and other cities imported Caucasian or Persian instruments such as saz, ud, rabab and duduk (in Georgian: duduki) are played. The accordion (garmon), the concertina (buzika) and even the Spanish guitar has been adopted as instruments of accompaniment. Urban music with western harmonies using guitar accompaniment is being popular in the cities and around the country. e.g. Listen to the song "Suliko" in youtube. Panduri. It is the most popular. It is a plucked fretted lute with three strings. The resonance box is hollow and with a boat shape. The shape may change according to the regions and maker. 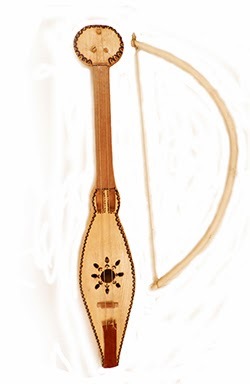 In eastern Georgia mountains is used the Mtiuluri panduri (fanduri) with a lengthened boat shape resonance box. 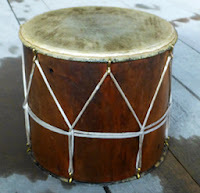 The panduri is used as accompaniment of dances and songs. Chonguri. Plucked unfretted lute with four strings. It is usually played by women. Chianuri. Two/three bowed instrument. There are no frets in the neck. The resonance box is rounded with stretched leather. It is played with a bow. The chuniri it is a similar instrument played in Svanetia. Changi. 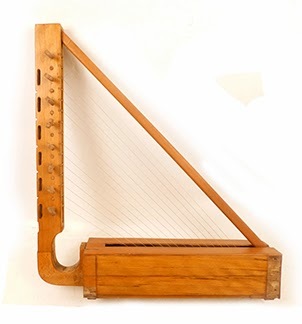 Triangular harp. It is very popular in Svanetia. 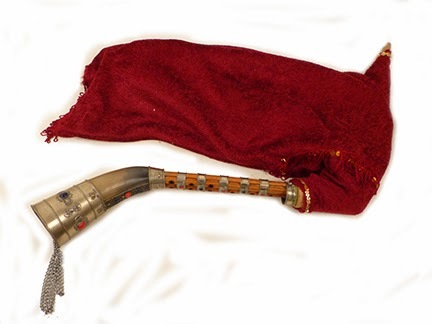 A similar instrument can be also found in Abkhazia as ayumaa and Ossetia as duodastanon. Larchemi/Soinari. Panpipe with six cane tubes. Different sizes and tunings. Played by megrelians and gurians, respectively, of western Georgia and close to Black Sea. Salamuri. 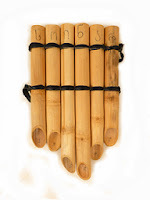 Whistle flute made of cane or wood with 6-8 finger-holes. It is similar to the Azeri tutek and Armenian tutak. Zurna. Reed wind instrument with a conical ending. It has a double reed made of a flattened cane on a metal pin. It is also very popular in Azerbaijan and Armenia. Pilili. 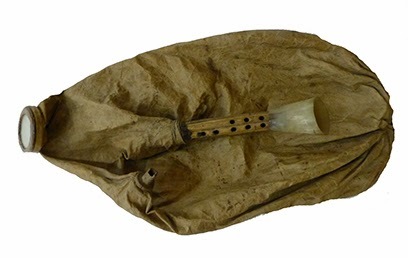 Reed wind instrument used in West of Georgia as accompaniment of dances and comic songs. Gudastviri. Bagpipe with two melody pipes and no drone. “Guda” means bag and “stviri” means pipe. The Chiboni is a bagpipe played in the south of Georgia. It is popular in Ajaria region. It is similar to the Armenian parakapzuk and the Turkish tulum. The meskhetians in the south of Georgia, bordering Turkey, they also use the word tulum. Stviri. Flute made of cane. Played by herdsmen and children. Bul-buls. Ceramic small whistles. The bird shape is the most common. Similar to Armenian pepuks. Buki. It was a military large trumpet made of metal. The khoroto is a similar instrument. They are now obsolete. Buzika. Caucasian concertina used for dancing and accompaniment to songs. Diplipito. 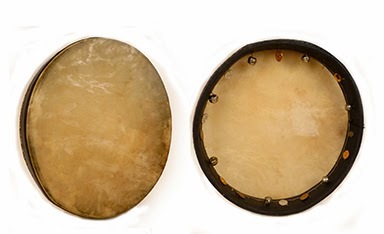 Small ceramic double kettle drum with leather membranes played with sticks (similar to Azeri gosha nagara and Armenian nagara). Georgian common ensembles use the salamuri, chonguri and panduri; panduri and daira; changi and chuniri; chiboni and dholi. Other Caucasian instruments may be used as an ensemble of a pair of dudukis accompanied by dholi and an accordion accompanied by a clarinet. In the picture below you can see a male choir with women holding a panduri, and other instruments such as the accordion (garmon) and doli. Duduki: Wind instrument with a sweet and mellow sound. It is very popular in Armenia, being the most famous Armenia player Djivan Gasparyan. Apkhyarta. Bowed instrumend of 1-2 strings played in Abkhazia. *: Pictures taken in State Museum of Georgian Folk Songs & Musical Instruments. (Address: 6 Samgrebo St, Tbilisi).